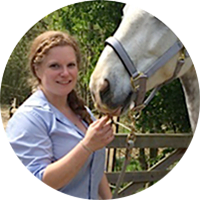 Eleanor Andrews is a graduate of the ESO and combines human and animal osteopathy in her practice in Kent. She is passionate about animal welfare and is a committed member of our postgraduate Animal Osteopathy teaching team, helping ensure standards within the profession are of the highest level. Prior to my study of osteopathy, I was a keen rider who worked with horses on a daily basis – involved with the Pony Club and British Horse Society and as a riding instructor for all ages and abilities. I also worked with riders, developing training programmes and evaluating their form. I wanted to find a career that would allow me to continue working in the equine field but didn’t consider osteopathy until I needed treatment for a riding injury of my own – that’s when I realised osteopathy was the career for me. How did you make the transition to animal osteopathy? Once qualified as an osteopath, I completed a postgraduate animal osteopathy course, which was the only one of its kind in the UK at that time. During my studies I was able to find a yard that was happy (with a vet’s authority) to let me practise on their horses. The yard was also a riding school, which meant I was able to work on a mix of horses. After I’d completed my course I started to work on the liveries here in Kent as well and my practice grew through word of mouth; other horse-owners saw for themselves the benefits of osteopathic treatment and asked if I could treat their animals. My patient list started to build and I now treat horses, from grass roots up to hunting and top competition level, as well as dogs, cats and occasionally the odd sheep. I’ve also built a good relationship with a number of local vets; although there was a lack of knowledge and a little scepticism at first, the results spoke for themselves and I now have regular referrals, particularly for animals with degenerative conditions. And I’ve never had the need to advertise. Being an equine osteopath really involves being part of a wider team, working alongside vets, farriers, saddlers, hydrotherapists and other paraprofessionals. In particular, I enjoy working with trainers to understand the outcome they want from a particular horse, then helping them by devising a treatment and exercise programme to support this outcome. As well as being part of the animal osteopathy team, I now lecture on the ESO’s M.Ost degree programme and have joined the School’s International Department, which involves visiting different countries to delivering lectures in osteopathy. I’m so glad I chose a career in osteopathy. My working week consists of treating animals, humans of all ages (from newborns to patients in their 90’s! ), lecturing and travelling. I have the opportunity to live my passion and no day is ever the same.